dDepartment of Radiology (S.T. ), University of California, Los Angeles, Los Angeles, California. BACKGROUND AND PURPOSE: The safety and efficacy of the PulseRider for the treatment of wide-neck, bifurcation aneurysms at the basilar and carotid terminus locations were studied in a prospective trial, the Adjunctive Neurovascular Support of Wide-Neck Aneurysm Embolization and Reconstruction (ANSWER) trial, reporting on initial 6-month angiographic and clinical results. This report provides insight into the longer term durability and safety with 12-month data. MATERIALS AND METHODS: Aneurysms treated with the PulseRider among enrolled sites were prospectively studied. Updated 12-month data on clinical and imaging end points are included. RESULTS: Thirty-four patients were enrolled (29 women, 5 men) with a mean age of 60.9 years. The mean aneurysm height ranged from 2.4 to 15.9 mm with a mean neck size of 5.2 mm (range, 2.3–11.6 mm). At 1 year, there were no device migrations or symptomatic in-stent stenoses. Raymond-Roy I occlusion was achieved in 53% of cases at the time of treatment and progressed to 61% and 67% at 6 and 12 months, respectively. Adequate occlusion (Raymond-Roy I/II) progressed from 88% at 6 months to 90% at 12 months. No recanalizations were observed. There was 1 delayed ischemic event. Good outcome (mRS 0–2) was achieved in 90% of patients. CONCLUSIONS: The updated 1-year results from the ANSWER trial demonstrate aneurysm stability and an acceptable safety profile for aneurysms treated at the basilar apex and carotid terminus. Prospective data from a larger set of aneurysms treated at other locations are required to assess how treatment with PulseRider compares with alternatives for treating wide-neck bifurcation aneurysms. The Adjunctive Neurovascular Support of Wide-Neck Aneurysm Embolization and Reconstruction (ANSWER) trial demonstrated the safety and efficacy29 of the PulseRider at 6 months for the treatment of wide-neck, bifurcation aneurysms arising at the carotid terminus and basilar apex. This report provides an update with 1-year data on clinical and imaging end points. Patients were enrolled from 10 US sites, all of which had institutional review board approvals (Medical University of South Carolina; SUNY Buffalo; University of Virginia; Long Beach Memorial Medical Center; University of Kansas Medical Center; Rush University Medical Center; University of Texas Southwestern; Mount Sinai, New York, New York; University of Massachusetts; Baptist Medical Center, Jacksonville, Florida). Aneurysms arising at either the carotid terminus or basilar apex that were relatively wide-neck were considered candidates for inclusion in the trial (clinical trial registration number NCT02312856). Beyond the primary 6-month FDA end points, extended safety end points for this update included death or stroke in a downstream territory postprocedure at 365 days. Technical success end points included device migration, in-stent stenosis, ability to retain coils within the aneurysm, and rate of aneurysm occlusion using the Raymond-Roy classification. Angiographic evaluation of these technical end points was adjudicated at each time point by a core lab blinded to the site performing the treatment. While all patients underwent angiography at 6 months, imaging follow-up at 1 year included MR angiography (n = 8), CT angiography (n = 1), and digital subtraction angiography (n = 21) (3 lost to follow up). All 12-month imaging was evaluated by a core lab. The PulseRider device is a self-expanding, nitinol implant (Fig 1) delivered on a stainless-steel delivery wire within any commercially available 021-diameter microcatheter. The device is fully retrievable and can be repositioned and torqued to fit the relevant anatomy. The device itself has significantly less metal than a conventional stent with most of the surface area coverage focused at the neck of the aneurysm. It has an open leaflet structure, which allows unrestricted microcatheter access to the aneurysm once deployed. The device is available in both T- and Y-configurations, intended to fit the geometry of the daughter vessels arising at the bifurcation. The device is available in different diameters and lengths and is outfitted with 8 radiopaque markers to aid in positioning. It can be positioned with both “wings” within the daughter branches (Fig 2), both within the aneurysm neck itself, or 1 in a daughter branch and 1 in the aneurysm neck. The device is then traversed with the coiling microcatheter for coil embolization. The PulseRider device is a self-expanding, nitinol implant that is fully retrievable and can be repositioned with radiopaque markers to aid in visibility during deployment and manipulation. The device is available in both Y- and T-configurations, as displayed, and has several different diameters and lengths available. The radiopaque markers are highlighted in red. Photograph provided courtesy of Cerenovus. 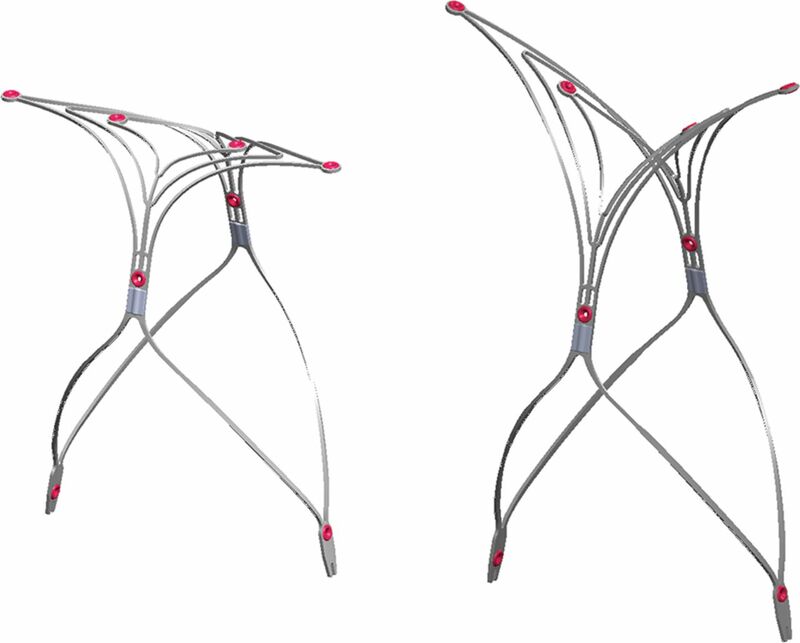 The PulseRider device is versatile and can be positioned with both wings within the daughter branches (A), 1 in a daughter branch and 1 in the aneurysm neck (B), or both within the aneurysm neck itself (C). The device is then traversed with the coiling microcatheter for coil embolization (D). Reprinted from Spiotta AM, Derdeyn CP, Tateshima S, et al. Results of the ANSWER trial using the PulseRider for the treatment of broad-necked, bifurcation aneurysms. Neurosurgery 2017;81(1):56–65, by permission of the Congress of Neurological Surgeons. Thirty-four patients were enrolled (29 women and 5 men), with a mean age of 60.9 years (range, 26–86 years). Nine patients had a prior coil embolization procedure to the target aneurysm (8 basilar apex and 1 carotid terminus), and 5 had prior remote subarachnoid hemorrhage. Aneurysm height ranged from 2.4 to 15. 9 mm, and dome size ranged from 2.8 to 16.2 mm. The mean neck size was 5.2 mm (range, 2.3–11.6 mm). Twenty-seven aneurysms were located at the basilar apex and 7 at the carotid terminus. Parent vessel diameter ranged from 2.7 to 3.6 mm (basilar apex) and 2.9 to 4.2 mm (carotid terminus). Of the 34 patients enrolled, 1 patient died of unrelated causes shortly after the 6-month follow-up, and 3 patients were lost to follow-up. Thus, 30 patients in total were imaged at 1 year. At 1 year, there were no device migrations or vessel stenoses. Raymond-Roy I was achieved in 53% of cases at the time of treatment and progressed to 61% and 67% at 6 and 12 months, respectively. Adequate occlusion (Raymond-Roy I/II) progressed from 88% at 6 months to 90% at 12 months (Table). No recanalizations were observed. No coil herniations or device migrations were observed. At 6 months, there was 1 instance (3.3%) of in-stent stenosis in a daughter vessel, measuring <50%, which was asymptomatic and not flow-limiting. At 1 year, the stenosis had resolved and remained asymptomatic. There were no deaths attributed to the device or procedure. There was 1 death involving a patient who was found to have metastatic cancer that was not known before enrollment in the trial, and the death was unrelated to the procedure or the implant. At 12 months, mRS 0–2 was achieved in 90% (27/30) of patients. One patient (1/30, 3.3%) had a delayed procedure-related ischemic event. Dual-antiplatelet therapy was discontinued after 6 months (per protocol), and at 9 months, the patient reported subjective mild and intermittent visual disturbances. During work-up, a small right thalamic infarct was identified on MR imaging. A thromboembolus from either the coil mass or the limb of the stent positioned in the right posterior cerebral artery was the suspected etiology. The data from the ANSWER trial established the PulseRider as a safe device in the treatment of bifurcation aneurysms.29 This report provides an update on the 12-month results of this trial, previously described at 6 months. Of note, beyond the 6-month follow-up period, the protocol was to discontinue dual-antiplatelet therapy and continue with aspirin, 325 mg daily. Angiographically, there were no device migrations or symptomatic in-stent stenoses identified. The single occurrence of asymptomatic in-stent stenosis of 1 branch vessel was entirely resolved at 1 year. Good outcome (mRS 0–2) was achieved in 90% of patients at a year. There was 1 delayed ischemic complication following discontinuation of dual-antiplatelet therapy. Aneurysm occlusion rates in patients treated with the PulseRider and evaluated by core lab adjudication were 53% at time of initial treatment and progressed to 67% and 90% for complete and adequate occlusion, respectively. These occlusion rates at 1 year compare favorably with the pooled data from 3 prospective trials using the Woven EndoBridge device (WEB; Sequent Medical, Aliso Viejo, California),30 which demonstrated complete aneurysm occlusion in 52.9%, Raymond-Roy II in 26.1%, and Raymond-Roy III in 20.9%. 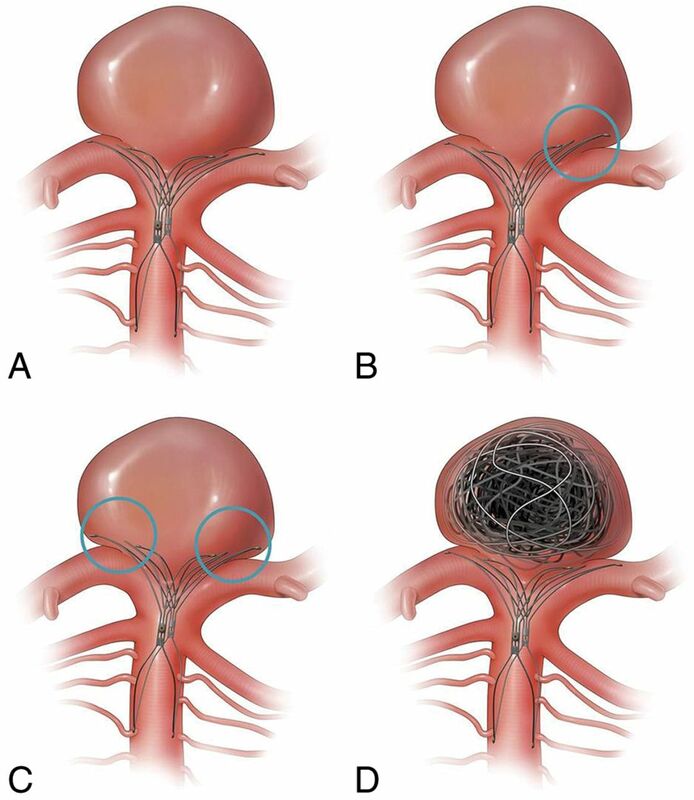 These angiographic outcomes demonstrate the immediate utility of the PulseRider as an adjunct to coil embolization of these wide-neck aneurysms arising at the basilar apex and carotid terminus, as well as the stability (no recanalizations were observed) and modest degree of flow diversion afforded as reflected in the progressive occlusion at both 6- and 12-month follow-up. Beyond streamlining the procedure, the results achieved in the ANSWER trial at 12 months compare favorably with the largest, multicenter case series of Y-stent placement (n = 45),15 which reported an 11% intraprocedural complication rate and immediate Raymond-Roy I occlusion rates of 40% that improved to 60% on the latest follow-up imaging, though only 30 of the 45 patients had follow-up imaging available. Among patients in the ANSWER trial, immediate Raymond-Roy I was achieved in 53% of cases at the time of treatment and progressed to 61% and 67% at 6 and 12 months, respectively. However, while the Raymond-Roy I occlusion rates are similar between PulseRider and Y-stent treated cases, Y-stent placement was associated with an 8.9% posttreatment ischemic event rate,17 compared with 3.3% in this trial. The 1-year follow-up data on subjects in the ANSWER trial show that the PulseRider offers a safe and effective adjunctive method of treatment for bifurcation aneurysms of the carotid terminus and basilar apex. We thank Alyssa Pierce for editorial assistance with manuscript preparation. Disclosures: Alejandro M. Spiotta—RELATED: Support for Travel to Meetings for the Study or Other Purposes: Pulsar Vascular; UNRELATED: Consultancy: Penumbra, MicroVention, Stryker, Minnetronix, Cerenovus; Stock/Stock Options: Penumbra. M. Imran Chaudry—UNRELATED: Consultancy: Balt, Blockade Medical, EndoStream Medical, Medina, Medtronic, MicroVention, Penumbra, Pulsar Vascular, Synchron, Three Rivers Medical; Stock/Stock Options: Medina, Medtronic, Three Rivers Medical. Raymond D. Turner—RELATED: Grant: Pulsar Vascular*; UNRELATED: Consultancy: Codman, Penumbra, MicroVention, Stryker, Medtronic, Q'apel Medical, Rebound Medical. Aquilla S. Turk—UNRELATED: Consultancy: BALT International, Blockade Medical, Cardinal Consulting, Cerebrotech Medical Systems, Codman, Covidien, EndoStream Medical, Lazarus Effect, Medina, MicroVention, Peumbra, Pulsar Vascular, Siemens, The Stroke Project, Three Rivers Medical, Vastrax; Grants/Grants Pending: MicroVention, Penumbra, Stryker, Cerebrotech Medical Systems, Pulsar Vascular, Covidien, Three Rivers Medical, Codman, The Stroke Project*; Payment for Lectures Including Service on Speakers Bureaus: MicroVention, Penumbra, Stryker, Pulsar Vascular, Covidien, Three Rivers Medical, Codman, The Stroke Project; Stock/Stock Options: Blockade Medical, Lazarus Effect, Medina, The Stroke Project, Three Rivers Medical, Vastrax; Support for Travel to Meetings for the Study or Other Purposes: MicroVention, Penumbra, Stryker, Pulsar Vascular, Covidien, Three Rivers Medical, Codman, The Stroke Project. Colin P. Derdeyn—UNRELATED: Grant: Washington University, Comments: I directed the core lab for analysis for the ANSWER trial. This lab was supported by Pulsar Vascular. * J Mocco—UNRELATED: Consultancy: Rebound Medical, EndoStream Medical, Synchron, Cerebrotech Medical Systems; Other: Apama Medical, The Stroke Project, EndoStream Medical, Synchron, Cerebrotech Medical Systems, NeurVana, NeuroTechnology Investors, Comments: investor/ownership. Satoshi Tateshima—UNRELATED: Board Membership: Pulsar Vascular, Comments: Scientific Advisory Board for Pulsar Vascular from 2008 to 2016; Consulting Fee or Honorarium: Pulsar Vascular/Cerenovus; Grant: Cerenovus, Comments: educational grant for neurointervention clinical fellowship*; Stock/Stock Options: Pulsar Vascular, Comments: stock option 2008–2016. *Money paid to the institution. This work was supported by Pulsar Vascular. Accepted after revision January 10, 2018.